Design your own extreme obstacle course challenge by combining as many of the seven modular units as you like, in any configuration you want, to create your very own Rugged Warrior Challenge. Make it easy, make it difficult, change it up any way you like. You create it. Then challenge yourself and your friends and find out who is truly a rugged warrior! Inflatable. Modular. Extreme. This is no ordinary inflatable obstacle course; this is the Rugged Warrior Challenge! Design your own extreme obstacle course challenge by combining as many of the seven modular units as you like, in any configuration you want, to create your very own Rugged Warrior Challenge. Make it easy, make it difficult, change it up any way you like. You create it. Then challenge yourself and your friends and find out who is truly a rugged warrior! The corkscrew unit features two large side-by-side corkscrews tunnels that would-be warriors must climb through to advance to the next challenge. The A-frame unit has two red balls hanging from the inflatable A-frame structure that you must navigate through or use to knock your opponent over. 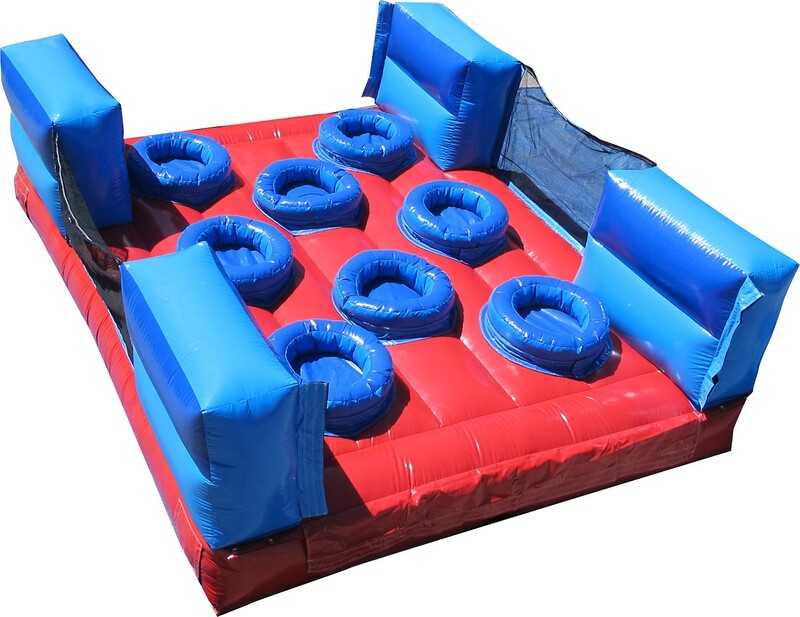 Challengers must jump or swing across on the ball and rope or risk falling into the inflatable moat, which can be filled with water, foam or ball-pit balls. The tire run unit features a series of fifteen inflatable tires that you run through like a boot camp drill. Rugged warriors who make it past the first three obstacles then face the leap of courage. To tackle this challenge, you must climb to the top of the jump tower and leap (if you dare!) into the Zero Shock free-fall air bag below. Our patented Zero Shock technology features a series of inflated ‘fingers’ which safely cushion the daring free fall. The sweeper unit features a series of pop-ups to navigate around plus a sweeper beam. Players must jump over the sweeper beam as it rotates to advance through the course. The corkscrew, tire run and sweeper units feature mesh sides as well as inflatable sides to allow for maximum visibility. The rope climb is a boot-camp style rope climbing net which warriors must scale before sliding down to the end. The final challenge is a steep cliff that rugged warriors must climb up and over using handles that go up the vertical sides of the inflatable wall with a moat-style ball pit on either side. When all units are combined, the Rugged Warrior obstacle course extends an impressive 131 feet. Long on courage, but short on space? The units can be connected via the 180 connector to create a U-shaped course which drastically reduces your overall length if space is tight. Dimensions: 131′ x 12′ x 19′, Weight: 1,810 lbs.